Our guests will have access to the lake, so whether you want to kayak or boat around the lake in the summer, melt in to the fall foliage, shop and eat your way through the area festivals, or head over to Ellicottville to ski the slopes of Holimont or Holiday Valley in the winter, Siesta Lodge is the perfect vacation rental for you. And don't forget to check out the newest additions to Holiday Valley - The Mountain Coaster and The Sky High Adventure Park! At the end of your busy day, your family and friends will have all the comforts of home. So relax in front of the fire (or build your own in the pit outside), BBQ on the grill, choose a movie from the video library, challenge someone at ping-pong, or take in the sunset and beautiful view from the deck with a glass of wine and some great laughs. We hope that you'll make some of your best vacation memories at Siesta Lodge! Siesta Lodge is located in Machias, New York (on Lime Lake). We're an hour south of Buffalo, NY and just a short 15 minute scenic drive to Ellicottville, NY (Holiday Valley - Aspen of the East), 40 minutes to Allegany State Park, and 40 minutes to the Salamanca Casino, less than an hour to Letchworth State Park, and an hour 1/2 to Niagara Falls. Our family has already made so many great memories here!!! 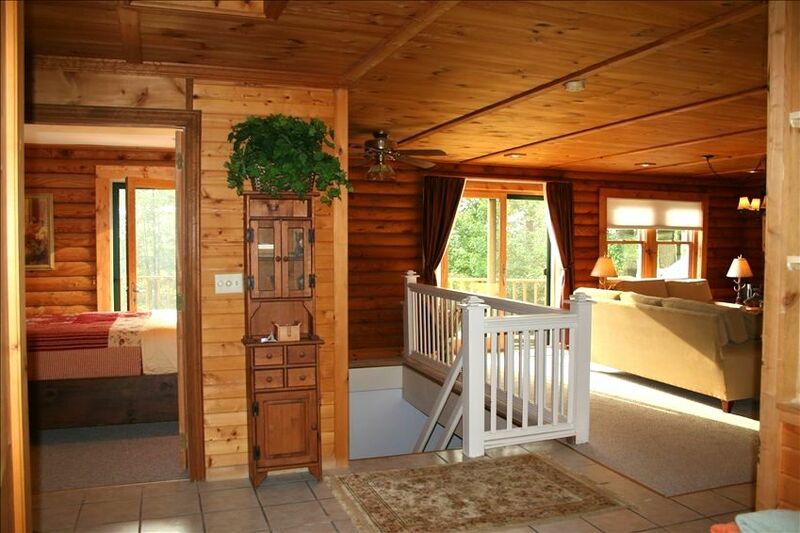 We choose this vacation property because we love weekend getaways too! It's close enough to Buffalo, NY for us to get away from it all whenever we need to. Relaxing environment just a short distance from Ellicotville, NY! Whether you like to ski, bike, walk around the lake or just lounge around -- this is the place for a great getaway! We had a group of 9 friends just trying to get away for the weekend and this cabin was perfect! Plenty of space, well stocked, cozy, clean, & comfortable. Julie responded quickly with any questions about the property and went beyond by accommodating last minute check out issues. Would definitely recommend! Great place, felt like home. Very clean and neat. Everything we needed in the kitchen. Would definitely rent if in the area again. We celebrated a birthday with a group of friends over the weekend and couldn't be happier with our stay. Julie, the owner, was prompt and easily available for questions or any needs. We skied Holiday Valley and it was just a short trip to town! Thank you for sharing your home. In town for wedding and was convenient location since wedding was in nearby West valley. Plenty of space for us and well supplied with kitchen utensils and plates. Enjoyed every morning on the deck drinking my coffee and looking out st lake. We love this perfect log cabin and we had a great weekend. The cabin had more amenities than we expected things like the baby gate ,high chair, extra blankets and wood to start the fire made it even better. Cozy and comfortable is how I would describe it plenty of sleeping space, living space , outdoor space and a great kitchen. We also enjoyed the lake renting the pontoon boat for a few days worked out great. Everyone had a good time in the game room mostly playing ping pong and relaxing around that nice fire pit. We would love to rent this log home for the Holidays maybe next year we can work that out. Thank You for sharing your home. Colleen and Molly along with our family's. The property was very clean and well stocked.